The original IceMaster.org was born as a personal web site hosted on a local ISP web host located in a Canadian town no one has ever heard of. As its webmaster's web design work gradually matured, together with the maturing of the web hosting industry and the internet's place in mainstream culture, the content had been moved to its own domain name in March of 1997. 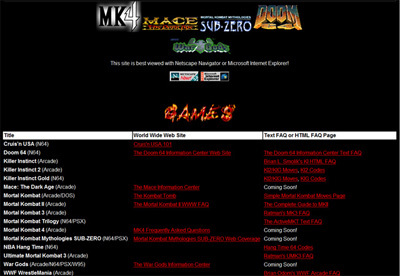 IceMaster.org grew during the #mk3 EFNet IRC channel era until its webmaster moved on to become a correspondent for The Realm of Mortal Kombat (before it was moved to the trmk.org domain) during the peak of MK4 arcade and home console coverage. The new IceMaster.org was originally a rough design intended to be launched as a retro site with images and info from the MK2 to MK4 period... Hopefully, it will one day be finished. For now, here are the scattered pieces of Mortal Kombat coverage. Be sure to check out TRMK for more on the new games. Copyright © 1996-2011 IceMaster.org. All Rights Reserved.